Now even better! Wonderful festive colors for any taste! As always, from Marcato Italy. Round barrel: 2" Height: 8.75" Heavy anodized aluminum barrel and caps, Thickness regulator, Plated steel piston and handle, 3 year warranty. Absolutely suberb quality. Made in Italy. The Marcato Cookie Gun is provided with 20 different cutting discs suitable for shaping different types of cookies. 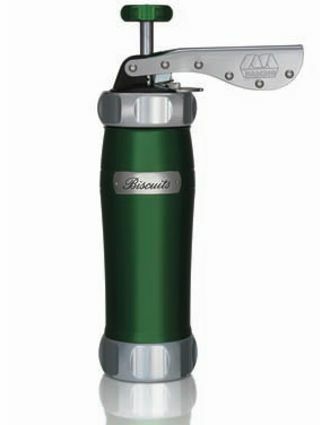 Round barrel: 2" Height: 8.75" Heavy anodized aluminum barrel and caps, Thickness regulator, Plated steel piston and handle, Comes with 3 year warranty, Made in Italy ( cookie press). New rounder model for 2012 ! Click the button below to add the Marcato Biscuits Cookie Gun and Press GREEN to your wish list.